In need of some help here, not sure where else to turn! My 1992 5.0L has, what appears to be, a progressive engine issue. It started out about this time last year - I would be cruising on the highway, when the car would "hiccup" or, mis-fire, it would seem. I didn't think too much of it at the time because it really only occurred occasionally during cruising at highway speeds. Before I started noticing this mis-firing, I had changed my cooling setup to a larger 3-core Champion radiator and dual mishimoto fans. I also upgraded to a 3G alternator (and yes, I upgraded the rear ground wire to 4Ga.). I didnt think the mis-firing and these new components were related, though. The codes I pulled when i first noticed the mis-firing were KOEO: 15, CM: 66, KOER: 11. I then started to really get into trying to solve my issue this spring, after the problem came back to life in full form. I had driven an hour away to a friend's shop to have a Panhard bar installed. The drive out there was absolutely fine - no problems. 8 hours later after the install, I drove home, and almost immediately starting my trip, the car misfired/cut-out/hesitated (whatever you want to call it) big time. What happened at this point in time is I would be driving on the highway in 5th gear, just cruising, when all of a sudden I would feel the hiccup. At the same time as the hiccup, my air/fuel gauge pinged at full lean (17.0 on my gauge). I would continue to try and drive the car (by this i mean, keep on the accelerator), but the car would not accelerate - instead it would act as if you were completely off the pedal and decelerate. If I were to keep my foot into the accelerator, a few moments into it, I would hear what I think are lean pops from the intake. After a few moments of this behavior, the car would "come back to life." The codes pulled at this time were still the same, but with the addition of 96 during CM. So at this point, I really got into diagnosing everything. I will try to "list" everything below for easier flow of events. I will also be as thorough as possible. The way I have been operating my test procedures is as such: I will plug my digital multimeter into a new circuit/component and tape my DMM to my dash so i can monitor it while driving. I drive the car up I-95 20-min and then back 20-min. The issue almost always arises on the return trip after power cycling at my turn around point. - I hooked up a multimeter to pin 19 on the fuel pump relay and ground to make sure it was getting constant 12V. I also hooked up a 2nd multimeter to the 12V switched power that goes to the pump to verify that the relay was switching power and providing constant 12V with koer. I monitored both these voltages via my multimeter throughout 30min of drive time. I was hoping that when the problem arose, the voltages would tell me something. But... the problem arose, and the voltages stayed true to their 12V. The code 96 went away... i wonder if it had something to do with me just simply cleaning up the relay and pushing in all the wire pins. EVER SINCE THIS, I have not seen code 96. - MAF SIG voltage is around 0.50 V during idle... I believe this is throwing the code 66... but I also believe the code 66 is partially due to my tune (tuner not using Pro-M Transfer Function). But, let's assume the tune is not the root cause here because since it was tuned many years ago, this problem only came to fruition recently. - with DMM hooked up to MAF SIG and MAF RTN while cruising in 5th on the highway i was able to keep my foot steady enough to have the DMM output a constant voltage of about 1.35V. When the issue occurred, i saw an immediate drop in voltage to about 1.0V. I'm not sure if this is significant or not. - At idle, spark plugs are sparking and coil plug sparks. With this, I can assume that the engine is receiving spark at idle. I'm not sure how to monitor SPARK during driving. - Distributor was pulled to check for shaft play. No shaft play. I ran into some difficulty with this step as this was the first time i have pulled a distributor. It wasn't until a week later that I found out I had re-installed the distributor a tooth off from TDC... so for a week the car wouldn't start. With the help of a friend, the distributor was re-installed with engine assembly at TDC compression stroke, and rotor pointing towards #1 spark plug wire... then set to 10° BTDC. It's after all this testing that I start to replace components to try and isolate the issue. - I replaced the distributor with a remanfuactured one from NAPA and Motorcraft TFI module from Rockauto. I installed both of these and could not get the car to idle properly even after correctly setting base timing to 10 deg btdc. It would start up, idle high, slowly come down, and then die once below 1000 rpm... normally only after a minute of runtime. I put my OEM TFI module back on the car and it will idle. So i sent my TFI module back and for a replacement. New TFI module shows up and I install it. It idles fine and got up to operating temperature. It showed no signs of dying on me so i decided to take the car out for the first time in months for a test drive... I didn;t make it more than 100 yards before she died on me... RPM just dropped instantaneously to 0. I couldn't get the car back in my garage. So, I installed the OEM TFI module again and again it would idle. I took it for a test drive and it loses power above 3k RPM and starting around 2.5k RPM, the RPM needle will start bouncing around. So, here I am... stuck, having tested what I believe to be most critical (and some non-critical) functions/sensors/components on my car with no clue as to why the engine is acting up. I mentioned above that this has been a 'progressive' issue because it all started with just a 'hiccup' or mis-fire during 5th gear cruising... and now the car can't be driven more than 100 yards without dying. I would appreciate any and all help to get this Fox running correctly again. -So, here I am... stuck, having tested what I believe to be most critical (and some non-critical) functions/sensors/components on my car with no clue as to why the engine is acting up. I mentioned above that this has been a 'progressive' issue because it all started with just a 'hiccup' or mis-fire during 5th gear cruising... and now the car can't be driven more than 100 yards without dying. What specific conditions and/or test results point you to having the MAF tested by Pro-M? Where I am currently at, some signs point towards the TFI module or timing-related. Just merely by the fact that one TFI module makes the car die right away and my OEM one makes the car lose power above 3k RPM, but won't make the car die. Once the TFI/PIP problems are sorted out, clear the stored codes in the computer. Clearing the codes by pressing a button on the scan tool or disconnecting the test jumper used to start the code dump does not erase the “learned settings”. All it does is erase the stored codes in memory. Clear the computer codes by disconnecting the battery negative terminal and turn the headlights on. Turn the headlights off and reconnect the all sensors including the MAF and anything else you may have disconnected. Then reconnect the battery negative cable.. This clears all spurious codes may have been generated while troubleshooting problems. It also clears the adaptive settings that the computer "learns" as it operates. Clearing the codes does not fix the code problems, it just gives you a clean slate to start recording what the computer sees happening. Run the car for at least 30 minutes of driving and dump the codes again to assure that you have fixed the code problem or sensor problem. This is necessary for the computer to relearn the adaptive settings that the computer uses for proper operation. The engine may run rough at first, but should smooth out as it runs for the 15-20 minute learning period. Then drive the car and look for the code 66 again. If it pops up, send the MAF back to Pro-M for repair/recalibration. I, too, think there is a PIP problem, most notably from the erratic behavior of the RPM needle above 3k RPM. Interesting about the clearing the codes trick with the headlights, wonder why I haven't heard of this before... I will definitely try this out! How long should you leave the the negative battery cable unplugged and headlight switch on? I'm assuming this is to drain residual power in system? Seems like you're in good hands and I have nothing to offer but I wanted to commend you on the thorough write up describing your problems and the work you have done to your car. How long should you leave the negative battery cable unplugged and headlight switch on? I'm assuming this is to drain residual power in system? All good except for step 3 - it isn't necessary. About 1 minute, it isn't critical; leaving it off more won't accomplish or hurt anything. However if you have a monster stereo system with big capacitors as part of it's power supply, then it may take up to 10 minutes. After spending some time today working on the car, I think I have 2 faulty TFI modules on my hands and wanted to see if you agreed. With my "new" re-manufactured distributor still in the car, I installed the new Motorcraft TFI module. Made sure to clear all KAM before test driving it. I drove it for about 10 minutes and everything was fine and then it randomly died on me. During this test drive, RPM needle behavior was smooth. Started it back up and drove it a little further and it died again. I got it back to my garage and pulled codes. Codes were pulled after maybe 15-20 minutes of drive time. I then installed my OEM motorcraft TFI module to see how the car would behave. I made sure to clear KAM after replacing modules. I test drove this component setup and above 3k RPM, the RPM needle would behave erratically. The car would feel down on power above 3k RPM as well. The car never died though. After about 15-20 min of drive time, I pulled codes. Notice how codes 18 and 96 went away. I then was curious if my "new" re-manufactured distributor was FUBAR. So, I swapped back in my OEM distributor... made sure to set timing correctly. Ran drive tests with both TFI modules in the same manner as before (clearing KAM each time). Both TFI modules behaved in the same manner as before and output same codes as before. So, I have one TFI module that causes erratic RPM needle behavior and a loss of power in high RPMs, and one TFI module that causes the car to die at random. What are you thoughts on these? Make sure that you got the correct TFI module... there are 2 different ones that look very much alike. Tools needed: DVM, noid light, safety pin. The TFI ignition in 86-93 Mustangs has 4 main components: the ignition switch, the coil, the TFI module and the PIP sensor inside the distributor. The ignition switch gets power from the two yellow wires that are supplied power by a fuse link located in the wiring harness that connects to the starter solenoid. I.) The coil is mounted on the driver’s side strut tower on most EFI Mustangs. It gets power from a red/green wire and a brown/pink wire from the ignition switch. That wire from the ignition switch feeds a 20 gauge blue fuse link that connects to the red/green wire. The fuse link protects the wiring and the ignition switch, since the fuse link for the two yellow power supply wires has a much higher current rating. Without the smaller fuse link protecting the smaller wiring used in the ignition circuit, a short there would cause the red/green wire to overheat and burn up. A bad TFI module or a bad PIP sensor have similar problem symptoms - a high speed miss on a warm engine. It can be difficult to tell which one may be the problem cause of the high speed miss on a warm engine. II.) The TFI module is mounted on the side of the distributor and supplies the ground for the coil. Every automotive power supply circuit uses the ground as the return path to carry power back to the negative side of the battery. The TFI switches the tan/yellow wire coming from the coil to ground. It gets power from the red/green wire when the ignition switch is in the Run position. The red/lt blue wire supplies a signal to turn on more power (dwell time) when the engine is cranking. The increased dwell can cause excessive current draw if the red/blue wire remains energized when the ignition switch is in the Run position. The trigger signal comes from the PIP sensor when cranking and the computer when the engine is running. The SPOUT jumper plug enables computer controlled spark advance. When the SPOUT is removed, spark advance is locked at the setting determined by the mechanical position of the distributor. III.) The PIP sensor is in the bottom of the distributor under the shutter wheel. It is a Hall effect magnetic sensor that senses a change in the magnetic field when one of the slots in the shutter wheel uncovers the sensor. Then it supplies a pulse that triggers the TFI module to provide a ground to the ignition coil and tells the computer to trigger the fuel injectors. A bad PIP will often set code 14 in the computer and cause hot start problems. The fuel pump control looks for the PIP pulse to keep the fuel pump control circuit turned on and keep the fuel pump running. Replacing the PIP sensor requires removal of the distributor and pressing the gear off the distributor shaft to expose the sensor. For most people, a remanufactured distributor ($55-$75) is the solution, since they may not have access to a press. IV.) Troubleshooting the ignition system – no spark or weak spark. All the tests are done with the ignition switch in the Run position unless specified otherwise. A safety pin may be used to probe the wiring connectors from the back side. 1.) Check for 12 volts at the yellow wires on the ignition switch. No 12 volts and the fuse link near the starter solenoid has open circuited. 2.) Check for 12 volts on the red/green and brown/pink wires coming out of the ignition switch. No 12 volts, replace the ignition switch. 3.) Check for 12 volts at the ignition coil. No 12 volts and the blue 20 gauge fuse link has open circuited. 4.) Check for 12 volts at the red/green wire on the TFI module. No 12 volts and you have wiring problems. 5.) Remove the small red/blue wire from the starter solenoid (looks like it is stuck on a screw). This is a safety measure to keep the engine from turning while you are making measurements. Have a helper turn the ignition switch to Start and look for 12 volts on the red/lt blue wire on the TFI module. No 12 volts and you will have starting problems, but push starting the car will work OK. No 12 volts, replace the ignition switch. Be sure to reconnect the red/blue wire to the starter when you finish. 6.) Check the red/blue wire to make sure that it has less than 8 volts when the ignition switch is in the Run position. 7.) A noid light available from any auto parts store, is one way to test the PIP pulse. The computer uses the PIP signal to trigger the fuel injectors. The noid light plugs into the fuel injector harness in place of any easily accessible injector. Plug it in and it will flash if the PIP is working. No flash from the noid light and the PIP is suspect. To confirm the PIP is being the source of the non flashing noid light, look for 12 volts on the red injector wiring. Good 12 volts and no flashing noid light means the PIP has failed. 8.) Remove the SPOUT plug from the harness and try to start the engine. If it starts, replace the PIP. This is a common no start condition when the engine is hot. 9.) The TFI module is a go/no go item when you have a no spark/weak spark condition on a cold engine. It either works or it doesn’t. The TFI failure mode on a running car is usually a high speed miss on a warm engine. Many auto parts stores will test your TFI module for free. Bring along a hair dryer to get it hot while testing it and run several test cycles, since it often gets weak when it heats up. Spraying the TFI module with “canned air” used to dust computer keyboards while the engine is hot and misfiring is one way to check the TFI. Turn the can upside down and spray away; this will cool the TFI of quickly. If it stops missing, the TFI is the likely suspect. The coil is somewhat more difficult to pinpoint as a problem. A good coil will make a nice fat blue spark 3/8”-1/2” long. The problem is that one person’s perception of a fat blue spark looks like may not be accurate enough to spot a weak coil. The coil is cheap enough ($13-$16) that having a known good working spare might be a good idea. See the following website for some help from Tmoss (diagram designer) & Stang&2Birds (website host) for help on 88-95 wiring http://www.veryuseful.com/mustang/tech/engine/ Everyone should bookmark this site. With the information you provided, I was able to find that with added heat the Motorcraft TFI module had high resistance for the GND to IGN GND test. I returned this TFI module to Rock Auto for an exchange. The second Motorcraft module behaved in the same manner and tested the same. I decided to switch brands and got a Standard Motor Products TFI Module. This did not work either. The RPM needle with this TFI Module would fluctuate at idle - a fluctuation I had not seen before. From these tests, I thought the PIP of the re-manufactured distributor was bad (it's OEM), so I bought an MSD Pro Billet distributor. I installed this today and like previous tests, the car started up the first time OK and idled fine. I took it for a drive and it randomly died without warning after maybe 10 minutes of drivetime. Now, upon each startup, the car will last at most a minute and then die without warning. It doesn't stumbled or surge; it just falls to 0 RPM. I am starting to believe my issue is not TFI or distributor related. I have read how bad aftermarket TFI modules are, but the chances of 3 TFI modules and 2 distributors being faulty out of the box are extremely slim. I'm not sure what else to look for. Ideas? 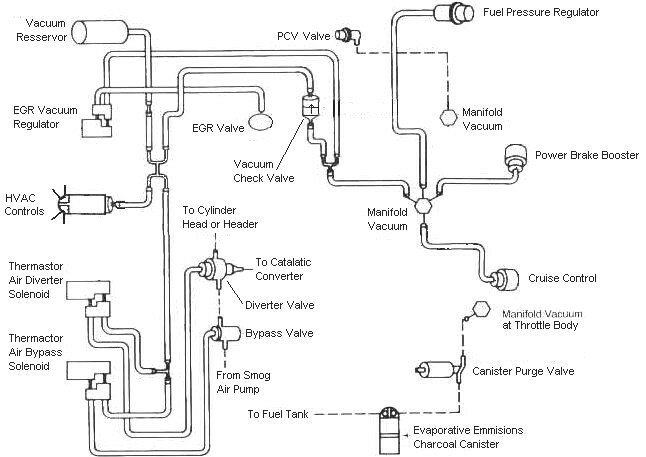 Everything you describe indicates a fuel supply problem, i.e. the dying & coming back to life. Too bad you didn't have the fuel pressure gauge connected when this occurred. The hiccup you had won't show on the gauge, it's too fast for the gauge to respond. The longer event will show the fuel pressure drop for 1-2 sec. You need a passenger to see it. Fuel pressure was normal at idle & blipping the throttle caused no change. Driving halfway down the block got progressively worse on subsequent days. Did all the things you did, nothing helped. Determined the only reasonable answer was the fuel pump. Dropped the tank, removed the pump assembly, tank looked like new inside. No junk at the bottom or floating around. Only had to look at the fuel pump sock to see what was wrong. It had split open & small pieces of it were trapped between the sock & the pump inlet. You can see one of the small pieces in the top pic. I discarded the pump because could not tell what might be jammed inside it. This was not the original pump. It was a 155 lph replacement installed 20 years earlier as an upgrade. The thing that was supposed to protect the pump killed it!!! You mentioned getting 10.5V at the inertia switch, meaning you are losing 1.5V from the relay. Is that enough power to adequately run your pump or is the wire losing something along the way causing the issues you're describing? Hey all - I never updated this thread, but the problem has been solved! The problem was twofold - Poor internal components in the distributor and faulty ignition switch. With a fresh rebuilt OEM distributor (w/ OEM parts) and a new ignition switch, the car runs like a champ. I also had the car re-tuned after the fact to be sure that all issues were buttoned up and she laid down 457RWHP! Needless to say, I am pleased. Quite the heartache getting through the issues, but happy in the end.... thanks to all for the help along the way! Glad to hear you fixed, do you think it was the PIP or the ignition switch?